Brokerdealer.com blog udpate courtesy of Forbes’ contributor Jeff Golman. 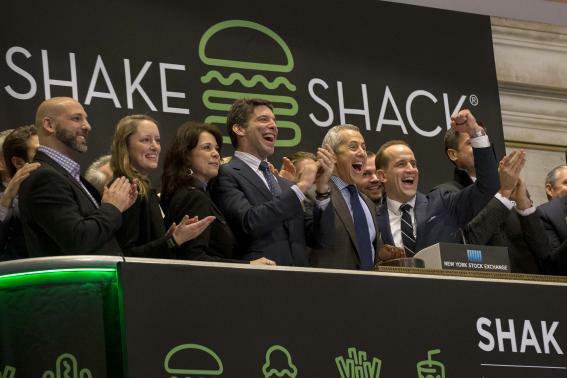 In late December, brokerdealer.com blogged about the exciting news regarding Shake Shack applying for an IPO. Shake Shack, a New York burger chain burger chain created by famous restaurateur Danny Meyer, is known for its fresh cut fires, 100% all beef burgers and hot dogs, and most of all its delicious shakes. The chain has been growing ever since its opening in New York City in 2000 and now has 63 locations open worldwide. Forbes’ contributor Jeff Golman believes that the burger chain’s IPO is too good to be true and is overdone. By now, I’m sure you know all about Shake Shack’s recent IPO. The burger chain’s nearly $2 billion valuation and 130% pop on day-one of trading was nothing short of impressive, albeit slightly anticipated. Shake Shack is just the most recent in a string of “fast-casual” restaurants to go public in the past 10 years, and investors are eating them up. However, it’s important to note that Shake Shack’s unit economics and demographic positioning made this a particularly interesting investment opportunity, which will be incredibly difficult to duplicate. And while the IPO may be a positive sign for similarly-placed restaurant concepts, it cannot be applied across the board. The public offering has always been a credible and attractive exit opportunity for the right concept, but it has boomed in the past year with some 1,205 issuers raising nearly $249 billion globally, according to data from Thomson Reuters. Increased confidence in the U.S. economy, low interest rates and positive IPO performance have combined to encourage businesses to make offerings and investors to take greater risks. However, just because a company can go public, doesn’t mean it should. Successful IPOs require a very impressive growth profile, and even the most well-positioned company still runs the risk of failure. Therefore, for many, a merger or acquisition may be a safer, smarter and preferred method of growing and funding a business. One of the major challenges of going public is the overwhelming emphasis on short-term financial performance. For example, the moment Shake Shack comes out with a disappointing quarter, its stock will likely drop, and possibly sharply. Since shareholders and analysts tend to concentrate on short-term earnings rather than long-term return on capital, public companies must often shift focus to meeting quarterly targets rather than bolstering strategic opportunities and innovation. In short, it’s hard to invest in long-term growth when you’re battling the markets. Another significant roadblock in the IPO route is that they don’t generate immediate liquidity. The ability to cash out completely on day one is unique to M&A exits, and in today’s robust M&A market the more quickly this money can be put to work, the better. 2014 was the strongest year for deal-making since before the recession with a 47% increase in the total value of worldwide M&A since 2013. There’s a lot of money in the private market right now, and anyone looking to exit should consider taking advantage. The lower costs, corporate stability, decreased risk, greater flexibility for management, and more stable valuations provided by a merger or acquisition far outweigh the benefits of being listed on the public market. Yes, IPOs are hot right now, but the problem with heat is that it always dies down. It may be easy to label Shake Shack’s offering as a success today, but time will tell if they can live up to the hype. It’s in our nature to look out for “the next big thing,” and once we find it there’s no turning back. But there is something to be said for stability and consistency. One of the reasons Americans love burgers isn’t just the delicious taste, but the sense of nostalgia we feel when we eat them. They bring us back to the good old days when life was just a little bit simpler. Just like a good burger, M&A is a slow cook aiming to provide the best flavor.